Providing the Indianapolis area with professional, fast and eco-friendly junk removal services. Most professional landscapers will tell you that if you were to fertilize your lawn only once a year, then the best time to do it would be in the fall. Grass grows a lot slower when the weather was down. A layer of fertilizer will deliver essential nutrients for your grass that allow the deep roots to stay vibrant and be on reserve for a healthy spring growth. The best time would be closer towards November. You want to make sure that you are applying and even coat to all your grassy areas. A crank style broadcast spreader is best to reach all the spots in your lawn. if you’ve noticed any bald spots in your lawn, then the fall is a good time to patch them up. You’ll find that many lawn stores carry a lawn repair mixture. This is a combination of lawn fertilizer, mulch and grass seed. All you need to do is rake over the loose soil in the bald spot. Then apply a thick layer of the lawn repair mixture. Tampa down lightly, water it thoroughly and then continue to give it water every day for two weeks. Just remember it will be a slow growth. There might be some other yard debris cleanup that you want to take care of like getting rid of cut down tree branches or other shrubbery. 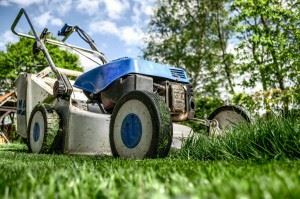 If your lawnmower is going to need replacement, then you should do it now rather than in the spring. To get rid of all those things all you need to do is hire Junk King Indianapolis. These are the junk removal pros who can quickly load up the truck with all your yard debris and rubbish. While there added, they can remove the rest of the clutter from around the inside of your house. Get your lawn and home ready for fall with a junk removal session from Junk King Indianapolis. This entry was posted in Indianapolis Junk Removal and tagged fall, Junk King, junk removal, lawn on September 26, 2017 by Junk King. Last updated September 26, 2017 .